Bergan Pet Supplies are driven by a unique mission: to create practical pet solutions that are simultaneously fun, inventive, original, and sustainable. This has led to the creation of unusually bold, exciting new products and unique spins on old favorites. They believe their products should help you create experiences with your pet that neither you nor your furry friend will soon forget. Whether you're simply going out for the day, or are em-bark-ing on a great adventure, Bergan's products will help you and your pet get to the finish line in comfort, safety, and style. At Pet Mountain, we pride ourselves on providing you with the very best products available (because what pet deserves anything less?). Bergan is so confident in their work, every product includes a 100% Satisfaction Guarantee! 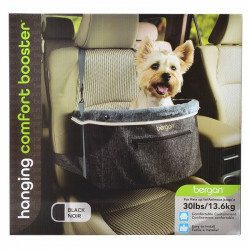 The Bergan family of items includes something for every aspect of your pet's daily life, including booster seats, comfortable carriers, harnesses, feeders and waterers, food storage, leashes, healthy supplements, seat protectors, bowls, and accessories. All of these and more are right here at Pet Mountain, at discount prices you won't find anywhere else! Be sure to browse all of our Bergan pet products to make sure you find just the right item to meet your (and your pet's) needs. Every Bergan product is made with pride and we at Pet Mountain are confident that you will be supremely satisfied with whatever Bergan product you choose. Pet Mountain is proud to offer you a wide selection of Bergan pet products, at the very best prices available anywhere! Take a look at all of our huge selection of great deals! Can't find something you're looking for? Let us know! We'd love to help. Be sure to check out our online coupons and discount shipping on all your favorite products.